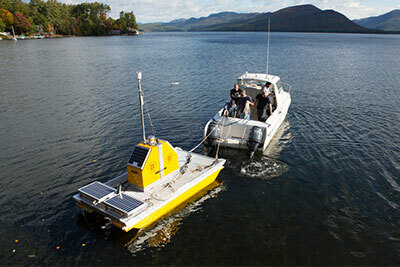 Acoustic Doppler Current Profilers (ADCPs) are acoustic sensors that measure the direction and speed of currents within the lake in three dimensions. They are currently deployed on the lake bottom and operate using the principles of SONAR technology, by the reflection of acoustic beams from suspended particles in the water. Given the critical role that organisms in a food web play in determining water quality, the Jefferson Project has initiated an effort to comprehensively sample the food web of the lake, its associated wetlands, and the largest streams that supply the lake with water. In these habitats, we are surveying the plants, plankton, invertebrate animals, and major fish species to determine their abundance and distribution around the lake and throughout the year. 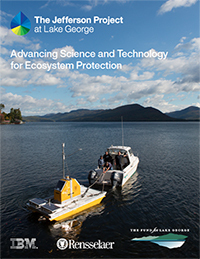 These surveys include the monitoring of any invasive species that are present. Sediments skimmed and extracted from the lake bed using cores - hollow tubes pushed several feet into the mud - can offer valuable insight into historic environmental conditions. Researchers analyze samples to determine the presence and abundance of various microscopic plants and animals, as well as information on pollen, chemical isotopes, and metal contaminants. The surface sediment details present-day conditions, while the cores provide a biogeochemical history of the lake - with sediments in the deepest sections reaching back thousands of years. For more than 35 years, DFWI has maintained the Offshore Chemical Monitoring Program. 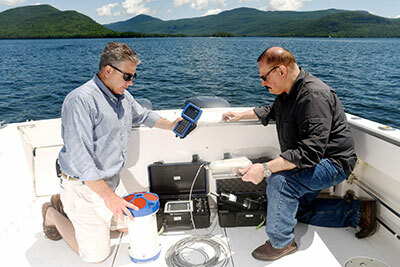 Begun in 1980 and jointly funded by RPI and The FUND for Lake George, the monitoring program was designed to assess water quality in order to help address concerns related to nutrient loading. Sampling focuses on essential nutrients for aquatic plants (phosphorus, nitrogen and silican compounds), as well as major cations, common anions, oxygen, chlorophyll, and temperature. Measurements are made at biweekly intervals during spring and fall, and at monthly intervals during summer, at a core set of six mid-water stations. Samples are collected using a depth-integrated sampler from the surface to 10-meter depth with grab samples taken at 20-30 meter depths, typically within 1-meter off the lake bottom to characterize the hypolimnetic water. Temperature and oxygen are measured at discrete depths extending to 30-meters to characterize the density structure of the water column and its oxygen concentration. IBM Research scientists examine sensor technology used in the Jefferson Project. 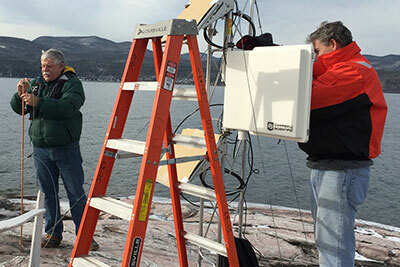 Installing a weather station on Gull Rock. 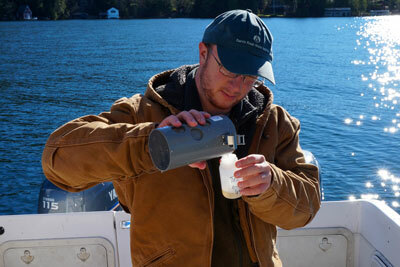 Collecting samples of zooplankton from the lake.